When starting an SAP Business One project there are a lot of things to think about. Some settings will have a big impact on the system and many of those cannot be changed once set. They are fundamental to the company database and its functions. Hence it is important to get it right. Some of those settings will be discussed here and many of them will be found in the Company Details screen. 1. Chart of Account TemplateThe user has the option to select the Chart of Account template from a predefined template or a user defined one, but once a transaction is performed, the Chart of Account template cannot be changed. The type of template selected will affect the look of your reports as the financial reports follows the structure of the Chart of Accounts. 2. Local Currency & System Currency - the option to change the Local Currency (LC) and/or System Currency (SC) is available only if no transactions have been posted in the database. Once a transaction has been performed, the settings value cannot be changed even if the already posted transaction is reversed. Before making the selection of System Currency, consider the reporting requirements of the customer or possible future needs in this area. 3. 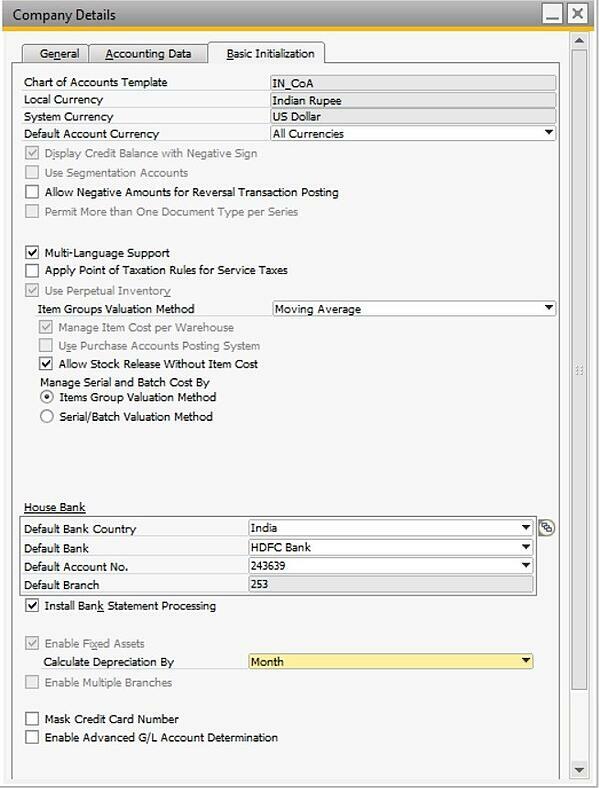 Display Credit Balance with Negative Sign – This setting is not relevant to how values are presented in financial reports such as Balance Sheet, Trial Balance or Profit and Loss Statement. In fact, the setting will affect how Customer and Supplier balances are displayed in the Chart of Accounts. It also influences entries of opening balances for G/L accounts. Depending on this setting, the opening balances must be entered as either positive or negative numbers. It is usually recommended to leave this setting as per default for the localization. Once transactions are posted, the checkbox is grayed out and no further changes can be performed. However, you have an option to change the selection for this checkbox provided the information in SAP Note 970813is followed. 4. Permit More than One Document Type per Series – You should select this option if the country regulations are relevant for the company. This setting determines the settings that are displayed in certain Document Numbering windows, and cannot be changed after it has been selected. If you are unsure about this setting it can be a good idea to contact your Local Product Expert. 5. Use Continuous Stock – Selecting this option indicates that the perpetual inventory accounting system is selected. On selecting this option, each inventory transaction is reflected also in the inventory related G/L accounts. After the first inventory transaction is posted, this option is disabled, and its status cannot be changed. 6. Install Bank Statement Processing - After Bank Statement Processing has been activated and journal transactions have been created, Bank Statement Processing cannot be deactivated and the database cannot be used with other solutions, such as the SAP Payment Engine and Cash & Bank Add-ons when it comes to bank statement handling. Manual Reconciliation will no longer be available for accounts defined as House Bank Accounts. Also, the window ‘Process External Bank Statement’ will no longer be available. Make sure to make an informed decision on what External Reconciliation functionality is the best option for your customer before changing this setting. 7. Enable Multiple Branches – Initializing the Multiple Branches functionality in the application is an irreversible process. Once a user opts to enable this feature, they cannot deselect the checkbox. 8. Enable Fixed Assets – Fixed Assets management function available in the application can be activated by selecting the checkbox ‘Enable Fixed Assets’. Once this checkbox is selected, you cannot disable it later. I hope this article helps you get SAP Business One setup perfectly from the get go!